Do you need Selenium supplements ? 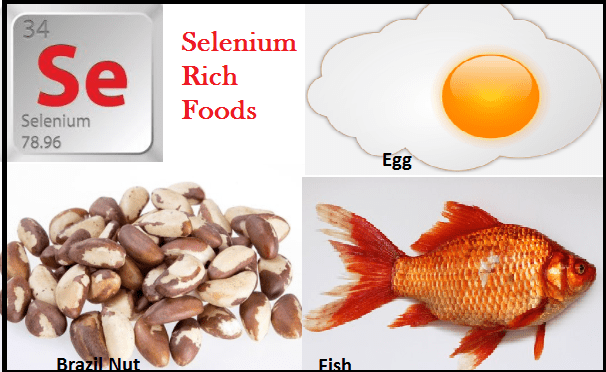 Selenium is an essential micronutrient found in Brazil nuts, chicken, fish, turkey, crab, nuts, cereal and eggs. Selenium is an “essential nutrient”, meaning our bodies cannot make it, and so we have to get it from our diet. Without it the heart, joints, eyes, immune system and reproductive system can suffer. We require 55 micrograms of selenium to maintain proper health and this selenium we must obtain through dietary sources. Selenium is a non-metal element that occurs in the earth’s crust. Selenium is necessary in the body’s production of selenoproteins. There are around 25 selenoproteins in humans and many of these are enzymes that act to protect the body against oxidative damage. Since the ageing process, as well as certain diseases, including cancer and cardiovascular disease, is associated with an increase in oxidative damage, maintaining adequate selenium intakes may provide some protection against these processes. Seafood and organ meats are rich in selenium. Plants pick up selenium from soil. The selenium content in plant foods depends on the concentration of selenium in the soil where the plants grow. Seafood and organ meats are rich in selenium. Other foods that have selenium include muscle meats, grains and dairy products. It can also be found in drinking water in some places. People living in places where the soil is selenium deficient have low selenium levels. People who smoke cigarettes or drink alcohol often are more likely to have selenium deficiency. Crohn’s disease, ulcerative colitis, or other conditions that interfere with how the body absorbs selenium can lead to low selenium levels. Kidney dialysis patients may also become low in selenium. The chemotherapy drug cisplatin can lower selenium levels in the blood, but it is not known if cisplatin can lead to a significant deficiencies. Selenium deficiency can impair immune function, increase incidence of cancer, cardiovascular and other degenerative diseases as well as overall mortality. In humans, selenium deficiency can result in Keshan disease, a juvenile cardiomyopathy apparent in the Keshan region in China. In China especially, low selenium intakes have also been reported to be associated with high incidence of hepatitis B virus infections. The human body can tolerate quite high levels of selenium without adverse effects on health. However, at high doses, more than 900 mg selenium/day, selenium can elicit toxic effects collectively termed selenosis, with symptoms including gastrointestinal upset, hair loss, nausea, irritability, fatigue and mild nerve damage. Selenium is no doubt very essential for our health but not much people are aware about it. Thank you for dlsuch a detaiped post, its very educating…! Thats so essential thing you are discussing in your post. We are not aware about this supplement at all. This is a must know info like. Can you tel me that is this supplement is available to our near store also?? To be very honest, I was not aware of this… It seems like Selenium is very necessary for good health… Will check out.. I didnt know much about selenium and its effects, thank you so much for sharing! I love the scintific touch to your each post. By the way I only eat egg so what are the vegetable that are rich source of selenium. Some time it is a necessity to take supplements for health. Glad to knew such detailed review. Great Share. honestly I have never looked Selenium that seriously prior reading to this post. eating the healthy food subsides the need of Selenium in body I always assumed that but how adulterated food we are eating this shows well in all heath reports. I agree to you that, it is essential for ones health & luckily I love both egg and fish so …no problem!! This is something i hadn’t heard before. Happy that i came across this post. Though needed in small quantities, it’s an important nutrient for the body n for those whose cannot get sufficient from diet shud take supplements as suggested in the post.